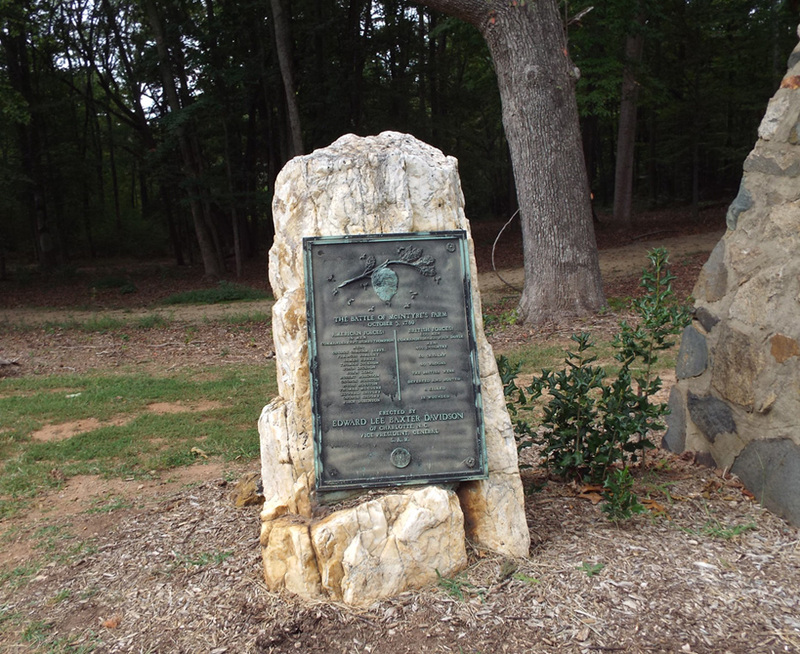 The Battle of McIntyre’s Farm marker is a single narrow light brown boulder about 5-feet tall with a bronze plaque attached. In relief at the top of the plaque is a tree branch with hornets buzzing around their nest. Below is the inscription with the insignia of the Sons of the American Revolution at the bottom center. It was placed next to the “McIntyre Skirmish” marker dedicated in 1901 by the Daughters of the American Revolution. ERECTED BY / EDWARD LEE BAXTER DAVISON / OF CHARLOTTE, N.C. / VICE PRESIDENT, GENERAL / S.A.R. The British Army under command of British General Charles Cornwallis occupied Charlotte in 1780. Being short on provisions they came to believe the revolutionaries had provisions stored at McIntyre’s farm. A foraging party of over 400 British troops sent to the farm was routed by 14 patriots under the command of Colonel George Graham. This skirmish is also known as the “Battle of the Bees,” as the patriots’ defense was aided by the British troops having disturbed a hornets nest. Edward Lee Baxter Davidson was proud of his ancestry and also placed and paid for several markers in the Charlotte area to relatives who were prominent during the American Revolution including General William Lee Davidson and Major John Davidson. He was a member of the North Carolina Historical Society and served as a District Vice President of the Sons of the American Revolution. The General William Lee Davidson Grave is located at the cemetery of Hopewell Presbyterian Church, at 10500 Beatties Ford Road Huntersville, NC 28078. 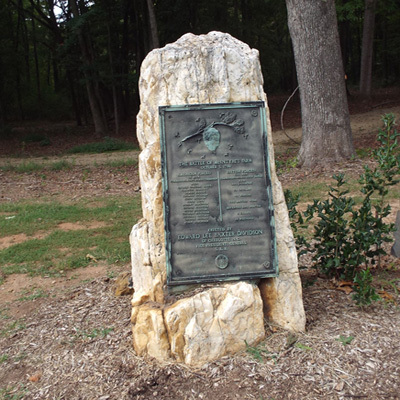 The monument is located just off Beatties Ford Road at the intersection with McIntyre Avenue in Charlotte, NC.A separate monument commemorating the battle erected by the Daughters of The American Revolution stands a few feet away. The marker stands on the grass under shady trees, close to the road.